The Housel Bay - Britain’s most southerly hotel - has entertained numerous high-profile guests since opening in 1894 including George Bernard Shaw (1913) and the radio pioneer Guglielmo Marconi (1900). Other notable visitors to have checked-in include G K Chesterton (1922); the wife and daughter of Benjamin Disraeli; Baroness Von Richthofen (1904); and the silent movie star, Harold Lloyd. It is said that the future George V also stayed at Housel Bay in 1908. 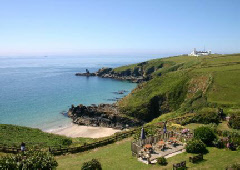 The hotel offers a total of 19 guest rooms and is just a short distance from both Lizard Point and Kynance Cove. Indeed, some truly spectacular scenery is right on the doorstep and few people will lack for places to explore in the immediate vicinity. Delightful villages such as Cadgwith are just a short drive away (or, more enjoyably on foot along the coast path), as indeed is the truly beautiful Helford River and its stunning waterside hamlets. The Seal Sanctuary at Gweek is an enjoyable excursion for all ages, while those seeking a little history will likely enjoy the Trelowarren Estate. The Housel Bay features its own restaurant and bar and is 3 star rated.